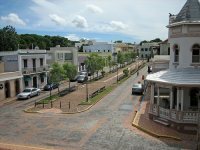 A historic town with a colourful past, San Germán was the second city founded in Puerto Rico by the Spanish. Its mountainous location made it an ideal escape for artists, poets, and revolutionaries, and present-day San Germán still carries that lively spirit. It has a number of pretty buildings dating back to the 16th century, including the Porta Coéli (Gate of Heaven) Church and the San Germán de Auxerre Church. Because of these, San Germán is listed in the National Register of Historic Places. There are also a few interesting museums, including the Lola Rodríguez de Tió Museum and the Ramírez de Arrellano y Rossell Museum. San Germán also hosts several religious and cultural festivals throughout the year.